PPE, fire safety products, rescue equipment and evacuation aids can all be found at this year’s Emergency Services Show along with advice on road safety, manual handling and looking after the mental health and wellbeing of your staff. Taking place at the NEC in Birmingham on 20 and 21 September, this free event offers health and safety professionals the opportunity to see and handle the latest equipment and attend a range of free CPD-accredited seminars. 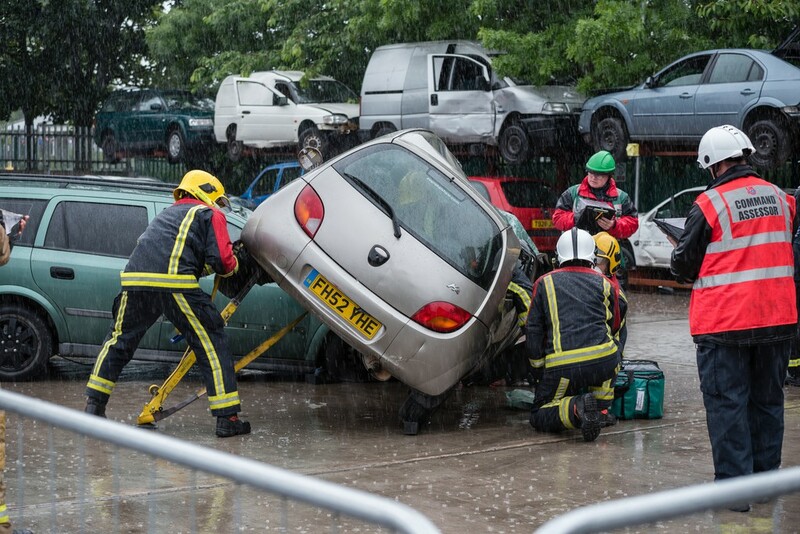 West Midlands Fire Service (WMFS) will be running an Extrication Challenge, supported and judged by the United Kingdom Rescue Organisation. The challenge will provide an arena to promote best safe working practices in all areas of road traffic collision rescue. Community first responder Dave Harford will highlight the dangers contained within a car that could impact how rescuers respond to incidents and, along with various vehicle manufacturers, WMFS will provide specialist information on the latest rescue tool equipment, new vehicle technology, high strength steel, airbags, SRS, hybrid and full electric vehicles. In the Lessons Learnt seminar theatre (sponsored by UCLan PROTECT) the health and safety challenges faced by crews responding to the New Ferry gas explosion and Didcot building collapse will be shared. Frankie Shaw, health and safety manager, Air Accident Investigation Branch will talk about the hazards and ownership of risk at an air accident site. Expertise in fire safety and the latest fire fighting equipment can be found around the show, and is likely to be of heightened interest in the wake of the Grenfell Tower fire. Visitors will be able to speak to the likes of the Fire Industry Association and Fire Sector Federation who will have representatives from BSI and British Automatic Fire Sprinkler Association on their stand. Hampshire Fire & Rescue Service will present a seminar about the online fire safety tool it has designed for members of the public to carry out a personal fire safety risk assessment. A new Health and Wellbeing seminar theatre will include advice on dealing with the emotional impact of emergency response and living with Post Traumatic Stress Disorder. Visitors will also be updated on the blue light wellbeing framework for all emergency services being developed by The College of Policing in conjunction with Public Health England. The Police Federation of England and Wales will be sharing details of its Protect the Protectors campaign which is calling for a change in legislation, leading to tougher sentences for those who assault emergency service workers. The Federation also wants better training and access to equipment and a wider roll-out of protection measures such as Taser, Body Worn Video (BWV) and spit guards. Reveal Media has first-hand experience of how BWV can improve the health and safety of emergency responders. Its sister-brand, Calla, has recently been used by Northamptonshire Healthcare NHS Foundation Trust with very positive feedback. “We wanted to create a small camera that makes a big difference for these people who love the job they do and take pride in how they do it: to protect them, reduce aggression and capture independent accounts of incidents if things escalate,” explains Ben Read from Reveal Media, who will be exhibiting at the show again this year. In the Innovations Theatre, Kent Fire & Rescue Service will share details of the Collaborative PPE Project, while around the exhibition visitors can find all the key names in clothing, footwear, head protection, breathing apparatus, evacuation aids, warning equipment and lighting solutions. Suppliers of PPE and technical clothing include Armadillo Merino, new exhibitor Beeswift, Hainsworth Technology, MC Products, Respirex, Safety Components and APT Fabrics. As well as a number of unique, trademarked fabrics, APT offers a bespoke fabric sourcing and modification service, seminars and technical textile training for companies all over the world. Bristol Uniforms will be showcasing its cutting-edge structural and USAR fire fighting garments, which were recently selected for the new South East collaborative procurement framework, following a rigorous tender process. The framework provides an accessible, affordable and highly effective PPE solutions for all UK fire and rescue services. Ilasco with Keela will be launching its new Insect Protective clothing, as well as new flame resistant and anti-static items. Bollé Safety will be launching a new range of safety glasses, goggles and prescription safety glasses at the show. It will also be demonstrating its unique Platinum double sided anti-scratch and anti-fog coating. Emtec Laboratories will be showcasing its custom-made earplugs. On the Vimpex stand visitors can see the Pacific F15 Structural Fire Helmet. Pacific Helmets is the only manufacturer in the world to design structural fire helmets that exceed all three of major international standards requirements: NFPA 1971:2013, EN443:2008, and AS/NZS 4067:2012. The Boot Repair Company urges everyone to bring their boots to their stand M76 for a free inspection and quotation for repair. Visitors can even choose their sole unit from the hundreds of Vibram soles available. Other suppliers of footwear exhibiting include Haix and Jolly Safety Equipment. Kee Connections Ltd are looking to engage with the wider health and safety community on their latest project to develop a new breathing air hose which is anti-static, heat resistant, lightweight and flexible. Scott Safety will be showcasing its latest in-mask thermal imaging technology intelligence system, Scott Sight. Coast torches will be launching several new and improved products including the Flagship HP314 1200 lumens long-range torch capable of up to 842 metres with a Flood Beam capable of lighting an area the size of a football pitch. Meanwhile Wolf Safety will be showcasing its range of protected portable lighting for safe use in potentially explosive atmospheres. Evacuation sleds will be exhibited by Stryker and medical device company Bellascura, which will be exhibiting in the UK for the first time. The growing exhibition for emergency responders has attracted the most respected training providers in the industry including the University of Central Lancashire and Training 4 Resilience. Many training equipment providers are also exhibiting including Crofton Engineering (which designs, builds and erects fire drill training buildings) and Lyon Equipment (which provides training in work and rescue at height). Suppliers of simulation aids and training mannequins include Ruth Lee, Bariquins and Simulaids. Ruth Lee will be exhibiting a range of fire simulation aids and training mannequins. “It goes without saying that health and safety is vital to any business. Whether the work revolves around working at height, or in confined spaces; out at sea, or in a care setting, training with mannequins can ensure that staff are prepared to act quickly in an emergency and more importantly, that they perform exercises safely for both themselves and others,” explains Paul McDonnell, Managing Director, Ruth Lee.